In Windows 10 you can find the disk defragment tool by first clicking the small search icon in the bottom-left corner of the screen. 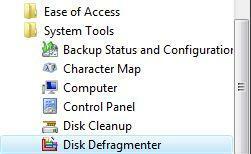 Then type: "defrag" and now click the "Defragment and Optimize Drives". Since Vista, defragment has been automatic so if your hard disk needs defragmenting and you leave your computer open for a few hours, Windows should automatically defrag your drive. To find Disk Defragmenter, go to Start Menu -> All Programs -> Accessories -> System Tools. As mentioned earlier, the application offers only two options: "Modify Schedule" and "Defragment now". 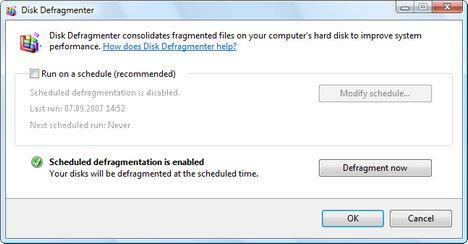 If you press the Defragment now button, the defragmentation process will start. Unfortunately you won't see a progress bar nor an estimation about the time left until the end of the process. You just have to wait until it finishes. This is why I recommend you to do this during the night or when you go to work and the computer is not being used. If you want to cancel the process, just press the Cancel defragmentation button. If you want to schedule automatic defragmentations, first click on Modify schedule. 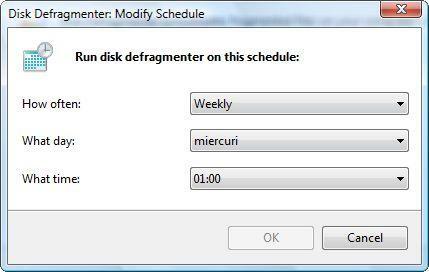 In the scheduling window choose the frequency, the day and the time when the automatic defragmentation should start. For most people, it should be enough to run the defragmentation once per month. I really liked the previous interface, for I knew how much time was left until it finished. It took me more than 12 hours to defragment my vista PC. yes, i agree , a simple interface is fine, but its un acceptable that it wont estimate when it will finish;seems to always take many hours and why change anyway?.. Windows XP allowed you to view the status of the Disk Defragmenter. I never took the time it does on Vista, and Vista does not have the status capabilities. This needs to be corected. I have been Defragmenting now for 4 hous, with no idea if its working, hung up or how much longer for completetion. I bought a new laptop a couple of months ago. As i now know it had Vista on it, god i miss my xp. I have left my defrag running all night for 2 nights running and its still running the next morning, is it ever going to get through the programme? I expect it will all get sorted out in the future, but what about now. I have tried downloading programmes to speed up defrag, but the downloads dont work, security reasons i gather. I try to run disk defrag as my laptop says i need to. I starts to run.... then about 5seconds it goes back to the first screen "You should defrag now" ANY IDEAS? the new vista defragmenter is a load of rubbish. aside from the fact that xp version was more visually appealin, it gave u an indication of when it was due to finish. additionally if the program freezes as it periodically does, u cannot tell as there isnt anythin movin that would stop. Sort it out Microsoft, ur supposed to be the technology "giants"!!!! I agree with most of the above, having no idera when my disk defragmenter will finish it work is absolutely rubbish. It will simply stop me from defragmenting unless I absolutely have to. As it doesn't give any information at all I guess I'll never know if I have to use it or not. As for buying an aftermarket disk defragmenter why should I have to. Vista cost me so much it should improve upon previous versions not become more primitive and user unfriendly. I would also like to throw in my two cents and say I hate, hate, HATE anything that doesn't give me feedback. At the very least, you need to indicate that _something_ is being done. This is an inconvenience when the defragger is working properly, and infuriating when it doesn't. For the record, mine has never worked. No matter how I approach it, I just can't get it to do the job it was designed for. I've had the window disappear on me, the DOS command return having accomplished nothing, and the program start up successfully and attempt to defrag only to come back 30 seconds later with the same message that, "[my] file system performance can be improved." Fantastic. When the Vista team figures out exactly how the XP team accomplished that, roll out a patch. In the mean time, I'll keep trying to debug the problem blind. my husband has windows vista on a brand new laptop, had a few problems so did a defrag, once started dont no how far it got but the laptop shut down and gave an error message and then booted into safe mode. anybody got any ideas why it does that its done it twice now. Is it possible to defragment for even a day to complete ? Microsoft hosed Disk Defrag with its new Vista operating system. It does not work and merely loops back to the beginning when executed from Windows, as far as I can tell. I have Vista HomePremium SP1 installed with the defrag utility scheduled to run every Mon at 2AM. At the scheduled time the task scheduler will claim it is running but I can find no evidence of this in the task manager process list. If I hit the Run button in task scheduler I also find no evidence of the process. If I run defrag from a command prompt I will then find the defrag process in the task manager process list. Two, when I return to the computer the next day after work I will open the task scheduler and under the defrag task History tab I will find that the defrag utility is claimed to have run continuously for the last 14 hours, only stopping because I moved the mouse. I will also find the computer in sleep mode. I have always heard that the HD is turned off in sleep mode so I cannot believe that defrag was running while the computer was asleep. I've also heard that Vista defrag will only run with lowest priority. Could it be that every slight tick of computer activity will cause defrag to restart from the beginning, effectively never allowing it to complete it's work? Ciprian, could you please use my email to respond?